I call this the car parking game. There is a curb that can fit up to five cars on it. We take turns parking new cars on the curb. 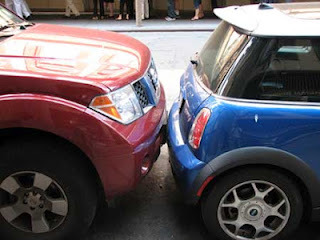 You may park your car anywhere on the curb where there is room. That is, its position can be described by any number between 1 and 5 (inclusive), including fractions. Cars take up some space, so the minimum distance between any two cars is 1. So for example, it is not possible to park cars at 1 and 1.5. If it is your turn and you have no space left to park a car, you have an excuse to double-park, and thus you win. (I know this win-condition sounds backwards, but the game is more interesting this way). So here's how we'll play. Leave a comment, state which game you are playing, and state where you are parking your car. I'll respond to your comment with my move. You may try as many times as you want, so persistence can be a substitute for cleverness. Game 1: The curb can fit up to 5 cars. I posted some comments on strategy. I tried searching for solutions for which N and M are odd. That way I automatically get that 2 is a common factor of N+1, N-1, M+1, and M-1. N needs to have a factor in common with M, M+1, and M-1. Therefore, N needs at least 3 distinct prime factors. N is odd, so the smallest N fitting this criteria is 3*5*7=105. 104 has prime factors 2 and 13. 106 has prime factors 2 and 53. Therefore, M needs to have factors 13 and 53. That is, M needs to be a multiple of 689. The rest of my search consisted of trying different odd multiples of 689 until one worked. There are many other methods to find a solution (and many other solutions), but that's mine. As you know, I presented "Asexuals: Who are they, and why should you care?" at the Western Regional LGBTQIA Conference this weekend. It was a refined version of my presentation last year. I added more pictures, new quotes, and showed some clips from the Hot Pieces of Ace YouTube channel. Thank you, Victoria and Southpaw for your help! And thanks to the AVENites who submitted quotes! I'd say that the workshop was a success. There were over fifty people in the room (fewer than last year, but the conference was smaller overall as well). Lots of people came up to thank me and talk to me afterwards. One of them was the head of UC Berkeley's Gender Equity Center. People were thanking me throughout the conference afterwards. People told me that other people were telling them how great my workshop was. I already know a few asexuals who are involved in queer student groups on campus. None of those people came. During the workshop, a couple of the anonymous questions were clearly from asexuals or questioning people. I mentioned to the head of the Gender Equity center that I knew of several aces involved in the queer student groups. He said he only knew of one. He named the guy, and I didn't know who he was. A couple people I had never met before stuck around to talk to me afterwards. One of them was part of the hosting campus, and said she wasn't out. Someone told me that their asexual friend attended, but was too shy to talk to me afterwards. Later, someone casually outed themselves to me, saying they didn't go to my workshop because they thought it would just be 101. They were right about that. Why is my workshop so successful? By now I've attended four queer conferences, and I've found that workshops are usually hit or miss. Most of the time, the facilitators don't really have any more authority or expertise on the topic than the audience. Sometimes this is just because the topic is very broad and no one is an expert. When no one is an expert, a workshop can only succeed by incorporating multiple opinions into a well-moderated discussion. But my workshop is not a moderated discussion, it's a presentation. The only thing I moderate are the Q&A sessions. It's clearly a workshop that succeeds on my expertise, not my skill in moderation. Apparently, spending a few years in the asexual community is sufficient to confer on me expertise in such a broad topic. Isn't that odd? But the audience isn't completely ignorant. For college-age queer activists, a lot of the groundwork is already laid. They know what invisibility is, they know what privilege is. They understand the multiple effects of stereotypes. They have plenty of experience with the excuses people give to marginalize people or maintain the status quo. They know that people in a minority can have different experiences because of personal experiences or intersection with other minorities. They are truly a wonderful group of people. This is all to say, I don't think it is hard to give a good presentation on asexuality to the college queer audience. It doesn't take much to be an expert. You just need a little experience and confidence. Arguably, the harder part is learning about other groups so that you don't say anything embarrassingly insensitive about them. And that's something worth doing anyway. Some weeks ago, a couple Christians came to a meeting of my secular student group. One offered his humble opinion that we were too young to choose atheism (though apparently not too young to choose Christianity). We confronted him on the obvious asymmetry of the statement, it came out that he thought atheism was an inherently dogmatic position, while Christianity is open. He thought atheism was "commonly" defined to be an absolute belief that there is no god, despite the fact that no one in a room full of atheists used that definition. Someone mocked him for these statements, and he immediately said, "Now there's a dogmatic atheist." Accusations of dogmatism are ubiquitous in all sorts of arguments. Religious people are dogmatic. Atheists are dogmatic. Leftwingers and rightwingers are dogmatic. Alties and doctors are dogmatic. But what does it mean to accuse the other side of being dogmatic? Does it mean that one time you were in an argument, and they mocked you? Does it mean one time you were in an argument and you failed to convince despite your killer arguments? If that's all that "dogmatic" means, it's hardly seems to carry any weight. We don't know what experiences led a person to believe the other side is dogmatic. We don't know the contexts of those experiences. It's like telling a little anecdote. No, it's worse. It's like saying, "I have an anecdote," but not actually saying what the anecdote was. We don't know why an atheist mocked them. We don't know if they really had a killer argument that an atheist ignored (especially since people tend to overestimate the persuasiveness of their own position). For all we know, they just had an encounter where an atheist referred to the opinion of some authority. Or they were just surprised that there is any public advocacy of atheism. Or perhaps they don't have any relevant experiences at all, and are just repeating what they hear from other critics. It's just like hearsay: "My friend's brother read in the paper that someone had an experience with dogmatic atheists!" Since accusations of dogmatism seem to be empty of meaning, I would hesitate to apply it even to religious people. If I have the impression that religions are dogmatic, where does this impression come from? I need to come up with a better reason than, "I had an argument, where the other person just couldn't see it my way." For instance, there is the fact that "dogma" is a word that comes from religion. For instance, Catholicism really does have a list of doctrines that people are supposed to believe. In modern practice, of course, people don't always follow these beliefs. * But they at least seem to aspire towards dogmatism. *For example, "98 percent of sexually experienced women of child-bearing age and who identify themselves as Catholic have used a method of contraception other than natural family planning at some point in their lives." From WP. I could also relate my experience of when I first questioned religion. I felt slightly ashamed of it, because I got the sense that it was somehow wrong to question religion, even though it was the skeptically correct thing to do. So I could say that I was struggling with Catholic dogma. But this was just my experience, and I don't know if it applies to people who feel comfortable enough to argue about religion with atheists. So I wouldn't offer the blanket statement that religion is dogmatic. A true Christian is a Christian who practices correctly. To practice Christianity correctly is to practice it well enough that it is to God's satisfaction. Therefore, true Christians don't exist. This is why, as an atheist, I won't be roped into arguments about which set of Christians are the true ones. They are arguments for Christians to worry about, and completely irrelevant to me. Blogging pace may be slow, as I am busy and/or just not investing the time. So here's a short one. This image was taken from Facebook, from the Being Liberal page. There is a special place in math hell for people who use pyramids (or similar 3D objects) to represent percentages. 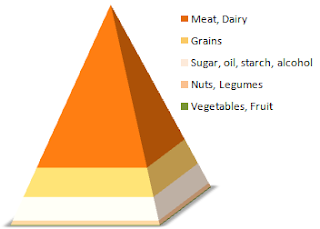 Observe, on the left, meat and dairy makes up 73.8% of the height of the pyramid. But it takes up 98.2% of the volume. This is because the base of the pyramid contains greater volume than the tip. It's a classic way to lie with graphics. It makes percentages appear different from what they really are. I could have made a graphic with the order reversed, and it would lie in the opposite direction. Or I could have just used a bar graph, as would have been appropriate. I wasn't going to comment on the content of the graph, except that that is a lie too. Those are not the Federal Nutrition Recommendations, not since 2005. 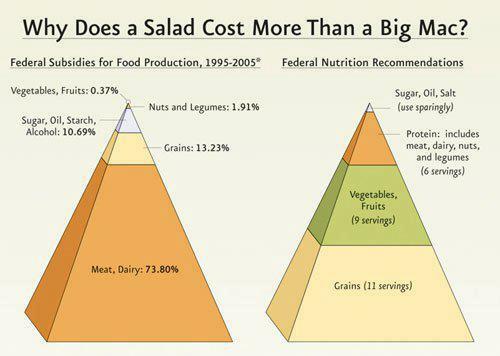 The old food pyramid was replaced in 2005, and replaced again in 2011. This seems to be an oversight rather than an intentional lie, since I think the new recommendations are even more different from the subsidy percentages. There are probably other problems with the graphic too, but I leave those as an exercise to the reader. In some previous posts, I discussed the notion of causality. I talked about how difficult causality is to prove, and how the very concept of causality breaks down in some situations. For example, if a particular trend has two causes, there is no objective way to define the relative importance of those two causes. In my humble opinion, the fact that "causality" breaks down in some situations indicates that it is not a fundamental property of the universe. If causality were fundamental, it would apply in all situations. You are free to disagree. I think it's an arguable point. Some readers may think that this is dissonant with my other views. I'm a physicist after all. Isn't the whole of physics based on the idea of cause and effect? In fact, you might even say I have it all backwards. On an everyday level, we have to deal with these free-acting humans, who appear to defy cause and effect. But the reductionists among us know that the free will is an illusion, and that on a fundamental level, it's all cause and effect. Right? |Ψ> represents the universal state at some point in time. U(t) represents the time-evolution operator. U(t)|Ψ> represents the universal state after a length of time t. t may be positive or negative. Where do you see causality here? Let's break it down. What if the universe were different? If instead of |Ψ>, we had |Φ> (that is, if the universe were in a different state), then it is indeed true that after time t, the universe would still be different. Changing the initial state changes the outcome. Sounds a little like causality! So perhaps we could say that |Ψ> causes U(t)|Ψ>. The past causes the future. Not the other way around. Therefore, if t is positive, we would say |Ψ> causes U(t)|Ψ>, but if t is negative, we would say U(t)|Ψ> causes |Ψ>. Is the present caused by all stages of the past? If we say |Ψ> causes U(1)|Ψ>, should we also say that U(-1)|Ψ> causes U(1)|Ψ>? Should we say U(-2)|Ψ> also causes U(1)|Ψ>? We might conclude that any given universal state has an infinite number of causes, corresponding to all the universal states preceding it. Are the laws of physics also a cause? We could also talk about U(t)|Ψ> being caused by the nature of U(t). That is, we could talk about the state of the universe being caused by the laws of physics which govern how it changes over time. But this seems to be a distinct sense of causation. U(t) does not cause U(t)|Ψ> the same way |Ψ> causes U(t)|Ψ>. What about objects within the universe? It is very clunky to restrict causality to the state of the entire universe. We would have to add more machinery in order to speak of one small part of the universe causing another small part of the universe. In fact, this is possible. Because of relativity, no information travels faster than light. And so the events at one point can only be caused by past events which are a finite distance away. The further back in the past we look, the further away the cause may be. 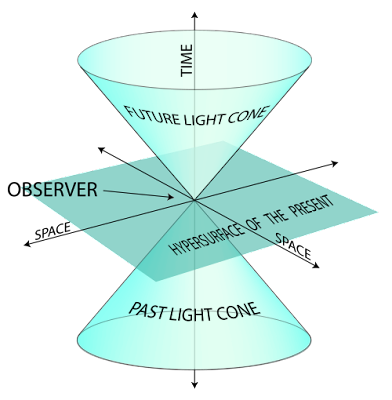 The past light cone is a way of illustrating what events at what distance could have caused an event at one point in space and time. Image from Wikipedia. Each event has infinite causes. I already suggested that the universe at any point in time is caused by all previous stages in the past. This is also true of each individual event within the universe. Additionally, at any particular past point in time, there are infinite points in space which might be considered causes. Are you caused by faraway stars? Betelgeuse is a star that is 640 lightyears away, meaning that the state of Betelgeuse 640 years ago may have "caused" my present state. But I usually see Betelgeuse as having no significance to my life. And yet, if we are considering all possible states of the universe |Ψ>, there must be one in which the state of Betelgeuse was different 640 years ago, and where this has an effect on my life. For instance, if 640 years ago, Betelgeuse went supernova, and released a gamma ray burst that killed me, then Betelgeuse would have "caused" my death. Why do we say a supernova has an effect on me, while an absence of a supernova does not? Is it because supernovaes which harm life on earth are rare, while absence is common? The picture is additionally complicated by the fact that there is more than one way to view the same physical laws. 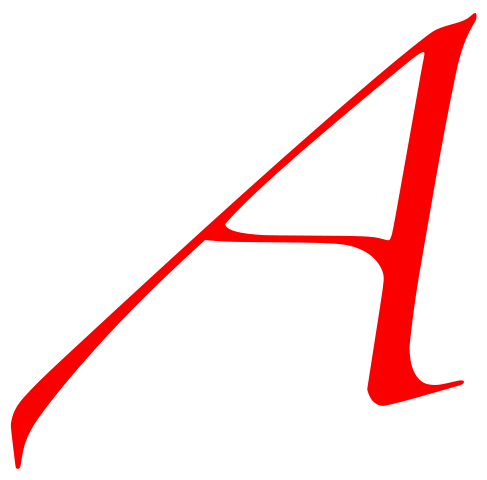 In the Lagrangian formulation of physics, we start with an initial state A and a final state B. The Lagrangian formulation tells you what path the universe must take to get from A to B. In this view, causation is an alien concept. I've discussed this years ago, opining that it is meaningless to ask whether the universe is governed by cause and effect. If causation appears in one formulation of physics, but not in another, and if each formulation predicts the same results in every experiment... that means a universe with causation and a universe without causation could look exactly the same. I do not wish to convince the reader that there is no such thing as causality. I argue that the concept of causality is not contained within physics. To the degree that physics does contain causality, it does not entirely match our colloquial understanding of "cause". Of course you won't find many physicists going around saying that there is no such thing as cause and effect. To a physicist, it is obvious that our everyday lives are quite different from the world of subatomic particles and fundamental physics. It is clear that baseball exists, even if it is not contained within fundamental physics. If baseball can exist, why not causality? 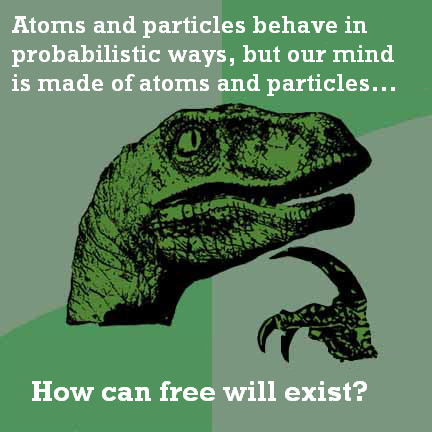 For that matter, why not free will? I've had experience in multiple queer discussion groups, and one common practice is to first lay the ground rules of a safe space. The purpose of the ground rules is to make sure the discussion is a positive experience for everyone, despite their diverse experiences and circumstances. For example, you're not supposed to "out" people if you see them on the street. One common rule is that you should stick to "I" statements. Instead of saying, "Well, we gays sure like our parties," it is better to say, "I sure like my parties". Or instead of, "Your statement is harmful to femme men," you would say, "As a femme guy, I feel hurt by your statement." I'm given to understand that "I" statements are used for a variety of purposes, and there are a variety of ways of interpreting the practice. I want to add my own fanciful interpretation of the practice. We all know, from skepticism 101, that anecdotes are unreliable as evidence. There is a strong selection bias in what experiences we remember, and what experiences we choose to spread around. Our experiences do not occur in controlled circumstances, and it is easy to miss important contextual information. Even more errors are introduced by the game of telephone. And at best, an anecdote is a sample size of one. And yet, there is an undeniable value to anecdotes in our everyday circumstances. If a friend tells me to try Sizzling Rice Soup, because anecdotally, it is so awesome, I'm not going to demand a peer-reviewed double-blinded study to support their claims. I'm going to say, "I've never heard of that! I might try some later." The anecdote is valuable, because there are no relevant studies, because it's not worth the effort to look up studies even if they were available, and because the anecdote is what prompted me to consider Sizzling Rice Soup in the first place. In a queer discussion group, we might talk about how we interact with our families, with different social scenes, with partners. On these topics, anecdotes are very appropriate. But it's important that we keep them as anecdotes. If I'm into crazy college parties,* and so are most of my gay friends (likely because I met them at parties), I may not conclude that this is a general truth about gay people. So rather than making a general statement, I make an "I" statement, explaining that I, for one, like parties. This way, I avoid erasing the non-partiers among us, and I avoid making inaccurate generalizations based on mere anecdotes. *This is just a hypothetical. I'm not taking any stance on crazy college parties. It's hard to avoid making at least a few generalizations though. Just a few paragraphs ago I said, "We all know, from skepticism 101," generalizing from my own experiences to say something about my readers. Defensible, indefensible? In my experience, discussion groups don't actively enforce the rule about "I" statements, because it could get annoying very quickly. Take away what you will. I will be presenting on asexuality at the 2012 Western Regional LGBTQIA conference. It's in Stockton, California, on February 24th. The registration deadline is February 12th! It's essentially the same presentation I made for the conference last year. Not breaking new ground, just presenting to a new set of people. This time I remembered to announce it before it happens, instead of after, haha.